3-D printers are great, as long as all you want to do is print Action Man out of one material, in one color. Multi-color machines exist, but they’re a far cry from the cheap, simple desktop manufacturing revolution we’ve been promised. I just got a peek at a nondescript box that could change all that. 3-D printing in color is a finicky business. The conventional solution is to use multiple extruder heads: one for each color of filament you want to print. While that works — kinda — it has drawbacks, including a decreased build volume (so you can only make smaller things), poor resolution, and unused heads drip-drip-dripping unwanted plastic over your finished build. Plus, it means buying a dedicated, standalone printer, something that costs thousands of dollars. The approach of Mosaic Manufacuring is different. 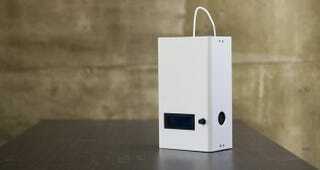 It uses a standalone box, called the Palette, which feeds a mulicolored filament to any single-color 3-D printer. Basically, you put the shoebox-sized Palette between almost any 3-D printer and four spools of filament. Then Palette chops and changes the color, so the printer has the right color material coming out of the printer head at any given moment. This gets rid of most of the problems associated with regular 3-D printers. There’s no dripping, no decrease in build size — the only drawback is a slight over-usage of materials every time the printer needs to change colors. Even better, the Palette can accomodate different types of material, not just different colors. 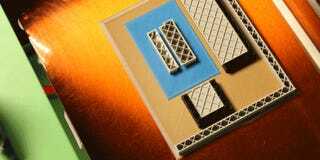 If you want to reinforce part of your model with carbon fiber, or wood, or even a conductive material, you can. The team showed me a prototype quadrotor body, built on a 3-D printer, with the power connections built right in — no need for wires to carry power from the battery to the motors. The multi-colored examples were just as impressive, ranging from the frivolous — a custom business-card-holder, anyone? — to a multi-colored child’s cast, designed to be more appealing to kids. The Palette is currently up for pre-order on Kickstarter, with the base model running $849 at the moment. As ever, there’s a level of caution to be taken with Kickstarter; but in this instance, the technology and manufacturing process are already perfected, so with any luck, scaling up production should be painless. Although it might seem like a fairly niche product, the Palette represents a major leap forwards for cheap, consumer printing. There’s a limited number of things that people really want to print out of one single color of plastic, but as soon as you add multiple colors, and multiple materials into the mix, the possibilities explode.